Not David! That’s one of the things I admire most in the author of so many of these psalms. He is utterly unashamed to acknowledge before others his weakness and dependency on God. Typical is this cry of desperation in Psalm 63:1. 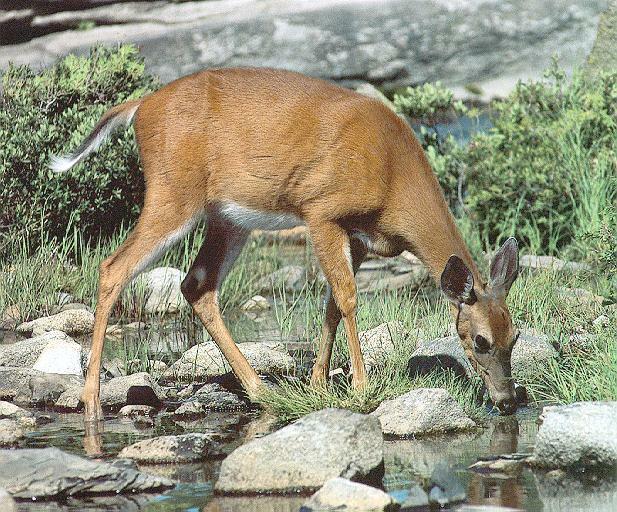 “As a deer pants for flowing streams, so pants my soul for you, O God. My soul thirsts for God, for the living God” (Ps. 42:1-2a). Need, per se, is not sin. Neither is spiritual hunger and thirst. Your heart’s desire for joy is not a result of the fall or bad breeding or a deficient education. Your passion for pleasure is not a demonically induced deviation from true godliness. Sin is simply the refusal to believe that Psalm 16:11 is true. Sin is the selfish determination to find “fullness of joy” somewhere other than in God’s presence and “pleasures forevermore” somewhere other than at God’s right hand. Let’s pause here in Psalm 63 for just a moment. David unapologetically declares his need: he speaks of seeking, thirsting, even fainting for God (v. 1). Not only is he needy, he is earnestly needy, desperately needy. As noted above, there’s no hint of anything sinful in this; nothing worthy of rebuke; nothing that calls for repentance. He continues. “So I have looked upon you in the sanctuary, beholding your power and glory. Because your steadfast love is better than life, my lips will praise you” (vv. 2-3). Here again, David makes no apologies for his enjoyment of God’s enjoyment of him. He would rather experience the steadfast love of God than revel in all the riches this life affords. There’s something in the lovingkindness of God that fills the emptiness of his soul immeasurably beyond any and every earthly promise. God’s steadfast love reassures and satisfies the desperate ache and longing in his heart. Is that wrong? Is David off base in focusing so firmly on the passion of his soul? Not in the least. This same point is made in Psalm 84. The soul of the psalmist “longs” for the courts of the Lord (v. 2a). The intensity of his desperation for God has brought him to the brink of fainting (v. 2a). People today faint for all sorts of reasons: a brief glimpse of their favorite celebrity, the news of a financial windfall, or possibly a game-winning touchdown in the final seconds of the Super Bow. The psalmist, on the other hand, faints for lack of God’s presence, or perhaps from the prospect of that breath-taking vision of divine and transcendent beauty. His singular, all-consuming passion was that he might be found in “the courts of the Lord.” There alone his “heart and flesh sing for joy to the living God” (v. 2b). Why? Because he found it altogether “lovely” (84:1). The beauty and sweetness of God’s courts transcend the most sublime of earthly locales. Of course, it has nothing to do with its physical composition or aesthetic features. The dwelling place of God is lovely because God is there! The author of Psalm 84 undertook a comparative study as he prepared to worship. He investigated the best and the most and the sweetest and the highest and the happiest this world could offer and drew this profound conclusion: “A day in your courts [O God] is better than a thousand elsewhere. I would rather be a doorkeeper in the house of my God than dwell in the tents of wickedness” (v. 10). These crossroad decisions in life don’t spring up ex nihilo. They aren’t causeless. The psalmist declares, “I choose God and the pleasures of life in his courts” because “the Lord God is a sun and shield” (v. 11a). The world, on the other hand, leaves me scorched and defenseless. “The Lord bestows favor and honor” (v. 11b). The passing pleasures of sin, on the other hand, lead only to misery and despair. “No good thing does he withhold from those who walk uprightly” (v. 11c). People, on the other hand, demand their pound of flesh. This is precisely what we see yet again in Psalm 63. “So I will bless you as long as I live; in your name I will lift up my hands. My soul will be satisfied as with fat and rich food, and my mouth will praise you with joyful lips” (vv. 4-5). But what does worship have to do with “my soul” or “your soul” being “satisfied”? Doesn’t that detract from the glory of God? How can God be honored as he deserves if we are concerned with the longing and passion and desire of our souls? In the answer to that question is seen the glory of Christian Hedonism, for the revelation of God’s splendor is the extent to which his people find unrivaled satisfaction in who he is on their behalf. Or, to quote Piper yet again, God is most glorified in you when you are most satisfied in him. Your passion for gladness competes with God’s glory only when you seek it in something other than him. So, don’t apologize for that relentless and chronic ache for joy. Rather, like the thirsty deer that you are, come to him who alone is life-giving water and drink to your soul’s everlasting delight!